So, are you as sick of hearing about that damn to-do list as I am? What on God’s Green Earth would inspire me to round up twenty-freaking-four projects and put them all in one tidy little post? And then, to add insult to injury, I gave myself a deadline of December 31st to complete the list. Of course, you know that means there’s absolutely no way I completed that list by December 31st. But I did put a pretty good dent in it. And now I have two more projects to check off, plus a bonus project that isn’t even on the list. Shall we get to it then? I think we shall. 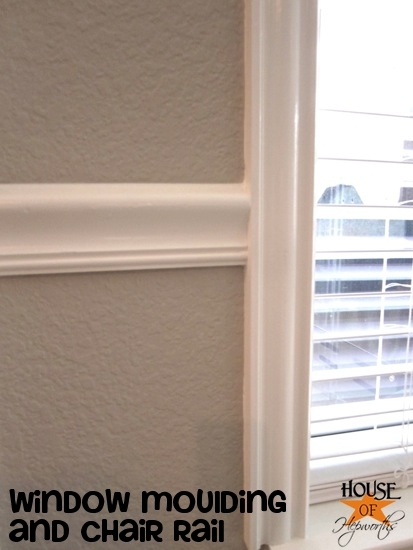 Project 12: Paint window moulding. I’m happy to report that I busted out the trim paint and got busy painting all the moulding on the 4 windows in my family and breakfast rooms. And I’ve got proof, baby! I’ll tell you what, I loooooove hanging trim and moulding. I could do it all day. But I HATE painting it. 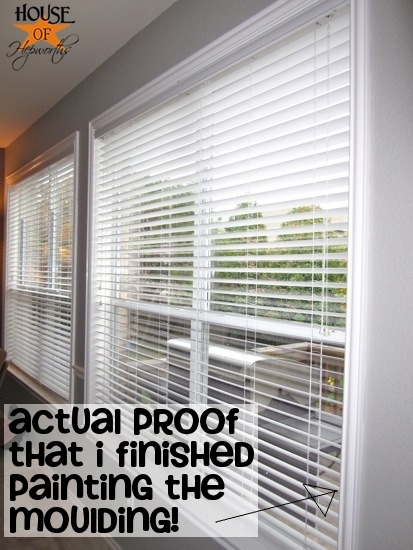 I think painting trim and moulding is one of the worst punishments I can think of. Does this look smooth as butteh or what? And now for a little tip. 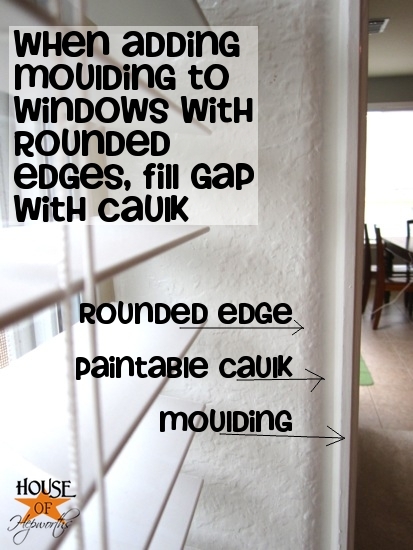 A long time ago, I showed you how to hang moulding along windows and edges that are rounded. I filled the gap with joint compound and sanded the heck out of it. And it looks good. But that was way too much work. So I found an even easier way to make those rounded edges look pretty good. Yup. Just fill them with loads of caulk, smooth it out with my finger, let it dry, and give everything a nice ol’ coat of paint. Saves me hours doing it this way. You can totally pin that picture if you want. Just sayin’. 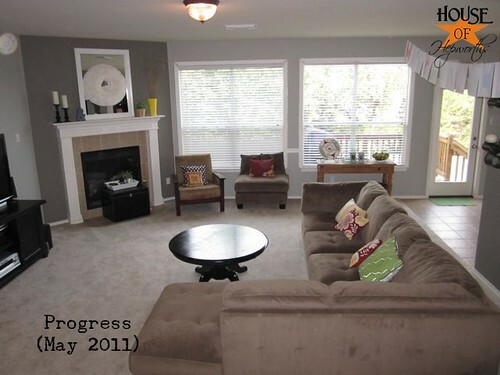 Can you believe we lived with stair-stepping paint for months? Can you believe I actually painted stair-stepping paint in the first place? Tack-to-the-double-eeeee. I finally coerced Ben into painting that hard-to-reach stairwell for me. He is da-bomb. Someday I’d LOVE to rip out that half wall and put in a wrought-iron railing. That would be delish. Yay. I can check 2 more projects off that damn to-do list. Oh, and sit tight for an official to-do list update post. You know, once I quit avoiding it. 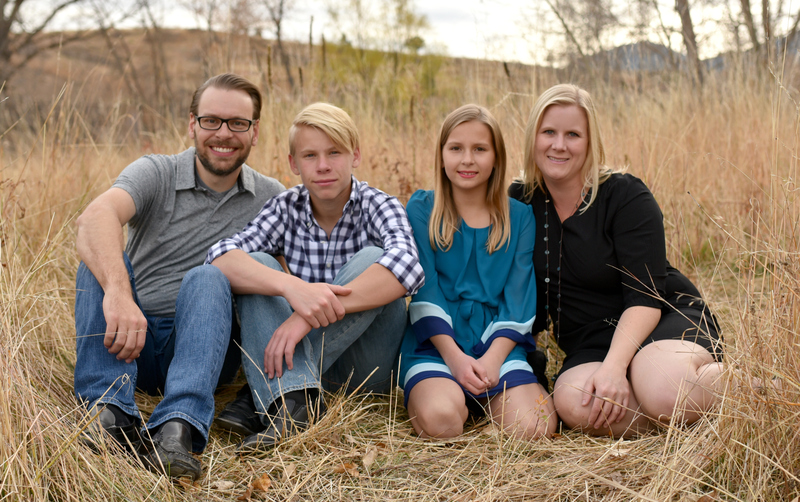 And now, the moment you all have been waiting for… the third and final project update. It’s such a small thing but has made such a huge difference. Remember when I added board & batten in Kinsey’s room? Well, I never quite got around to buying and installing new plug covers. Why does that last 10% of a project always take the longest to finish? 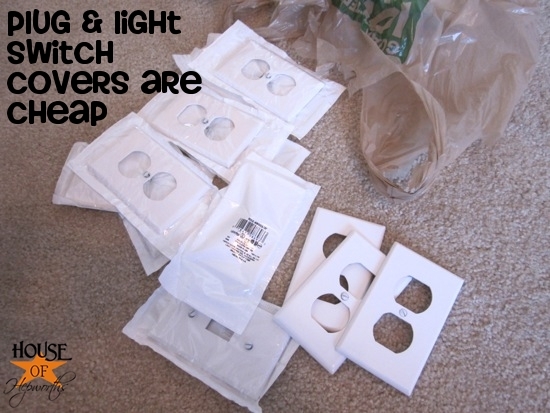 If you guessed that this project is about plug covers then you win a cookie! 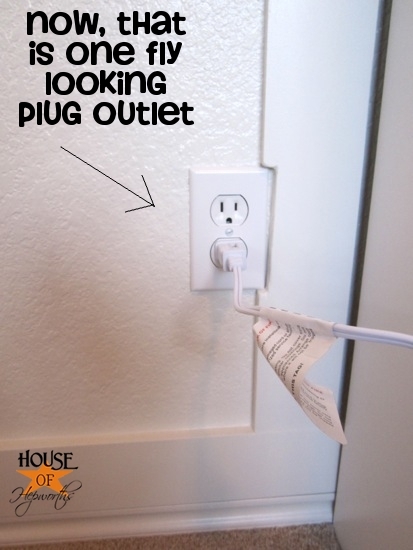 Did you know that plug covers are ONLY about a quarter each? 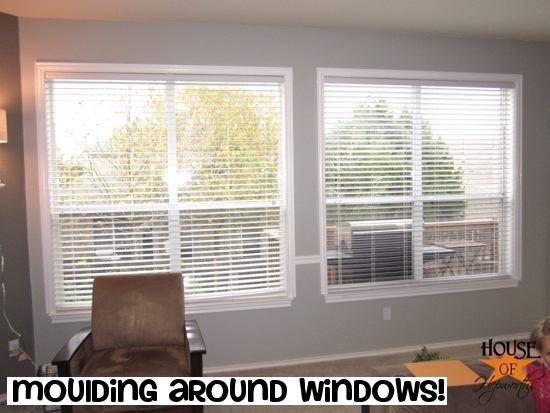 They are one of the cheapest things you can buy for your home. So next time you get paint all over one, or you ram your foot into one and crack it, just go buy a new one. They are not scary or intimidating. They are plastic and have only one screw. 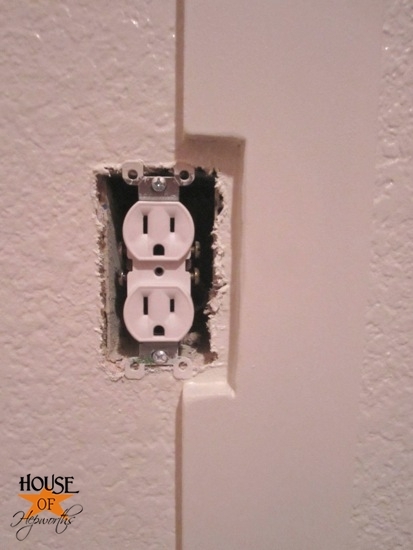 Replacing outlet covers is one of the easiest DIY projects. The board and batten project can officially be declared “complete” now. 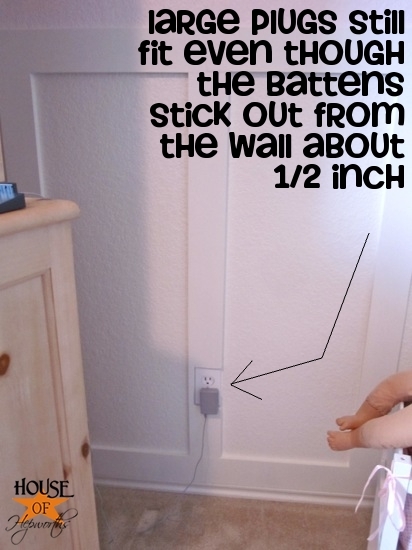 I thought about pulling the plug outlets out of the wall and installing them on top of the battens, but after about 2 seconds thought all I could think was, “too much work!”. 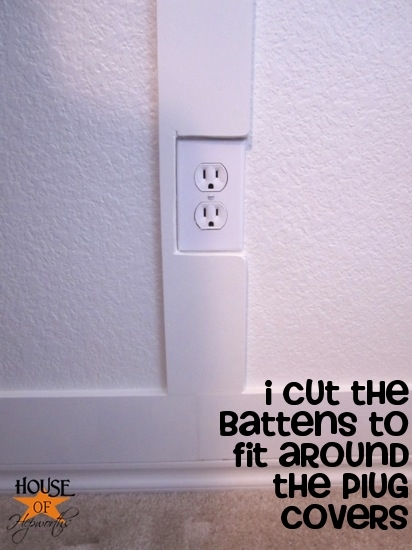 So I improvised and had the battens go completely around the outlet covers, and it worked perfectly. I spent about $1.50 on plug and switch covers and had them screwed in and ready to go in about 1 minute. They totally finish off that board and batten. Have you been working on any little projects lately? You know, the annoying ones that take only a few minutes that you put off for months or years? What projects have you been taking care of lately? Not sure if you can officially call it a project, but I bought a shower curtain to put into our bathroom 4 months ago along with new shower curtain hooks. All I needed to do was take the shower curtain out of the package and hang it, but no…left it on the bathroom sink until my children managed to get toothpaste splatters all over it. Then it took me another month to take the stinkin curtain downstairs to wash it so I could hang it up. FINALLY hung it up last week! Whoo hoo!! Looks soooo much better than just the plastic shower lining. Oh, and I’m totally ignoring the fact that Monday the before mentioned children managed to splatter toothpaste clear across the room onto the curtain so it once again needs washed. Wonder how long it will take me to do it? Allison you just crack me up. Love your sense of humor and style! Keep up the good work. How about I come over and paint your moulding for you next time? I don’t mind painting moulding 🙂 I am planning to re-do my potting shed and can NOT wait to do it! It’s attached to our house – it’s weird – and are getting a brand new roof this month so once that’s done I’m going to start organizing and making it pretty! Anywho…I’ve got plans, too! Oh, I love the satisfaction of completing even the smallest project! 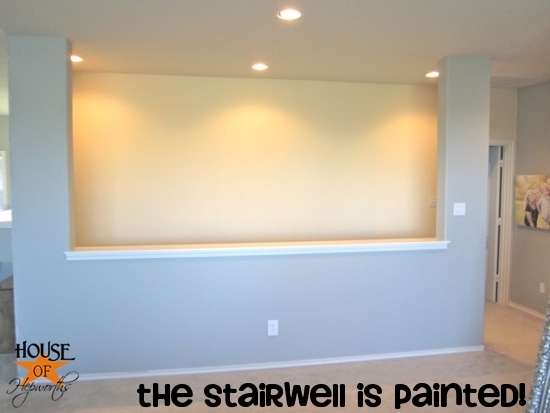 I love the stairwell paint color and YES wrought iron railing would be awesome! 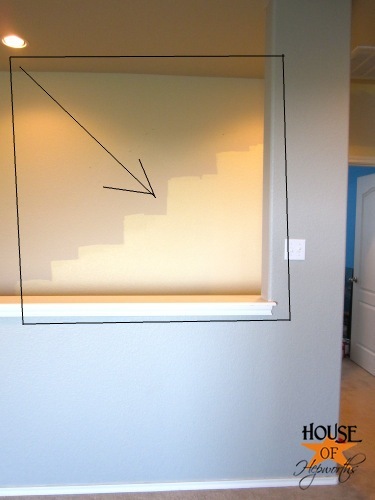 2nd, What color paint did you use on your stair stepping paint? I really like it! 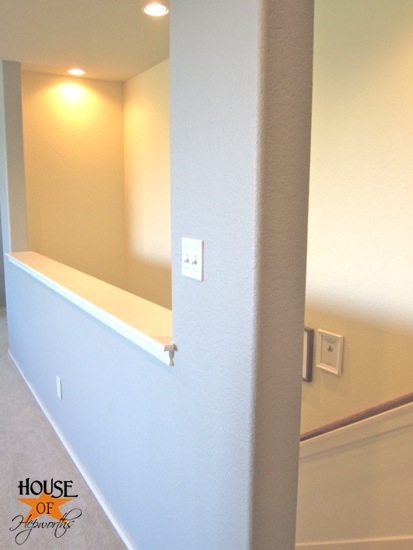 Ok, while I’m at it, what color did you use for the upstairs room next to the stairs too? 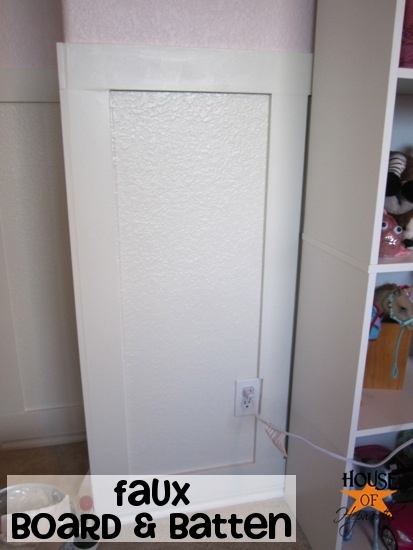 I just want to say, I finished your faux moulding project today.. and it was AMAZING! Thanks for the great idea!